COLUMN DESIGN: Authentic Replication wood. Scamozzi capitals and Ionic (Attic) base moldings / plinths. 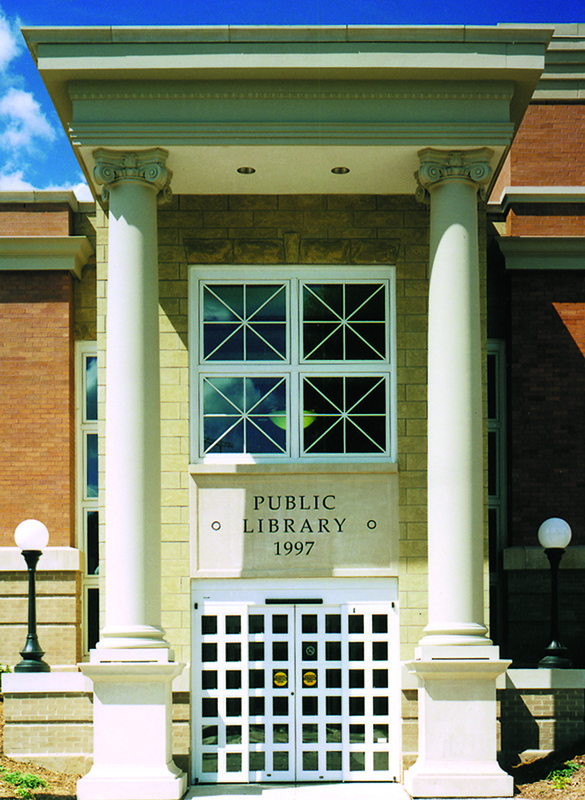 PROJECT COMMENTS: The Oskaloosa Public Library prominently displays (2) of Chadsworth’s Authentic Replication wood columns at the entryway. The columns were sanded, primed, and coated on the interior with asphaltum. Scamozzi capitals and Ionic (Attic) base moldings / plinths. Notice how the aluminum plinths have a small vent – this allows for continuous, cylindrical airflow up & down the column shaft, which helps preserve the wood column for a longer period. This entry was posted in Government Amenities and tagged Authentic Replication Wood Columns, chadsworth columns, oskaloosa iowa, oskaloosa public library, paint-grade clear heart redwood, scamozzi capitals by Chadsworth Columns. Bookmark the permalink.